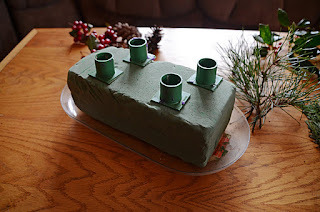 Happy Advent! The Christmas season sort of "snuck up" on me. We made up for it this past weekend by setting up our Christmas tree and decorating inside our home. In the midst of the busy, hurriedness of December lies the best part of the season...advent, the anticipation of the "coming" of Christ. It's just not Christmas without our Advent centerpiece, which I made the other day with my own two hands (yeah me!). I thought I would share how "easy" it is to make and encourage you to give it a try. The advent "wreath" consists of 4 candles (sometimes 5) surrounded by evergreens (and whatever else you'd like to throw in there). Where the wreath requires wiring the greens to a frame, the centerpiece doesn't take as much effort or supplies, but I'll still refer to it as a "wreath" because...it just sounds better. The advent "wreath" is a symbolic way to prepare your hearts and can be a fun and tangible way to get your kids involved. There are 3 purple candles and one pink. Sometimes people add a white one to light on Christmas. This is a "tradition" meaning there is no right or wrong way to include the advent "wreath". 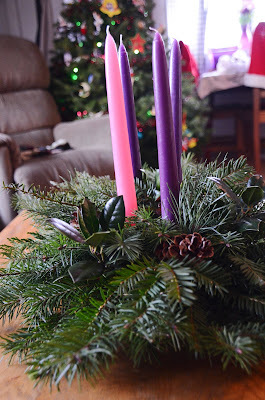 Each candle represents something, commonly the first candle lit on the 1st Sunday in Advent is purple and represents hope. On the 2nd Sunday in Advent you light another purple candle, for love. The 3rd candle is the pink one, for joy. And the 4th candle lit is purple, for peace. The white candle, if you choose to add one, can go in the center and is lit on Christmas Day. It is nice to do a family devotional along with lighting the candles. There are many out there to choose from. Or you can just read a little bit of the Christmas story each time and sing some Christmas songs. Like I said, there is no right or wrong way. 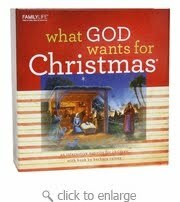 Several years ago we purchased a Christmas activity called "What God Wants For Christmas" by Family Life. It is similar to Easter's Resurrection Eggs, if you are familiar with those. It comes with a booklet to read over 7 days or all at once, if you want. There is also free PDF activity sheets you can download with coloring pages and other things. How does your family celebrate the Advent season? I'm always interested in hearing suggestions for things that may work well for you. So email me or comment with your ideas! Here are some of the items you may need to purchase for your centerpiece (these items can be found at your local craft store): A small rectangular plastic tray for it to sit on and to catch any water that may come out of the floral foam. 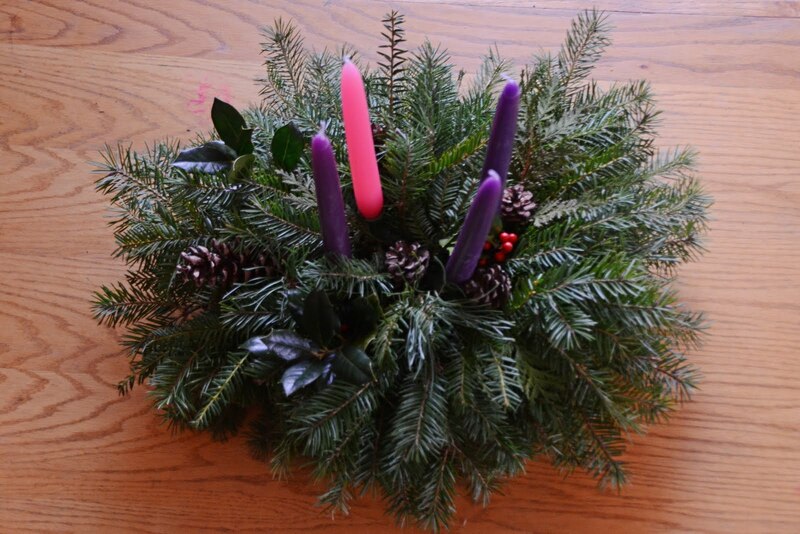 ; a rectangle of floral foam; 4 plastic candle holders; a box of Advent candles (they often come prepackaged or you can just buy your own 3 purple, 1 pink). My favorite part about my centerpiece is that all of the decorations I use come from my own backyard (literally). I take clippings from my various evergreens on the property. I also use any greens we trimmed from our Christmas tree (which this year I had a lot). 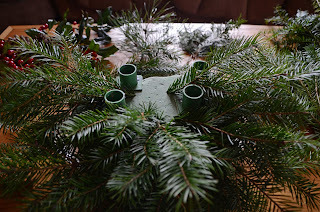 The bulk of the centerpiece is made out of the traditional greens, from our Christmas tree and our Ewe bush. I use the other greens here and there on the centerpiece to add contrast. I also have a holly tree and pinecones in my yard, which liven up the centerpiece, as well. If you do not have access to pinecones or holly, then you can purchase these items at a craft store and they look just fine. Once you have gathered all your greens and decorations, place the candle holders onto the green floral foam. I rarely do anything symmetrically, but that's just me. Put them wherever you want them. Now start adding your greens. I always have a pair of trimmers with me to cut the greens into the size pieces you need. You can start anywhere on the floral foam. "Larger" pieces should go on the sides and towards the bottom, "shorter" pieces are great for the top. I always put the greens in on an angle. 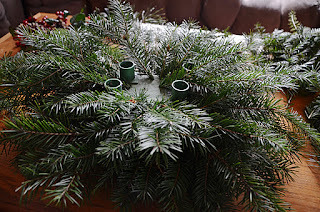 You don't want the centerpiece to be too bushy, so try not to make the pieces too long. Play with the layers. Experiment. Be creative! To some extent you have to fill the centerpiece by eye. Keep turning it to make sure you don't have any obvious gaps. 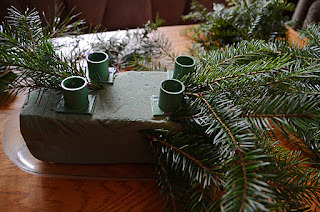 When you have it "filled" you can start to add the accent pieces, like the various pines, holly & berries, and pinecones. I usually just lay the pinecones on the top instead of securing them. When you have it the way you like, add the candles. The final step is to water the floral foam. I do this once I put it in its "final" resting place. I water the top, like I would water a plant. Make sure you go slowly since any excess water will leave the foam and fill the plastic tray its sitting on. The foam will absorb the water from the tray so I actually try to always leave some water in the tray. You will have to check on it every couple of days to make sure it stays "watered". May you have a blessed Advent season as you await and celebrate the coming of Christ, Emmanuel, Wonderful Counselor, Mighty God, Everlasting Father, the Prince of Peace (Isaiah 9:6).